Yes, climate change is real ... just like the world's climate alarmists vehemently contend. In fact, it's the norm. 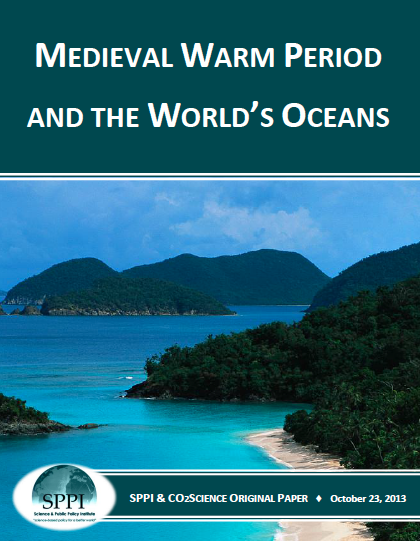 And in the several oceanic studies briefly reviewed above, as well as studies pertaining to the terrestrial surface of the planet, Earth's climate has been recognized as having shifted over the past century or so from the coldest period of the current interglacial to a significantly warmer state, but one that appears not yet to have achieved the level of warmth characteristic of the prior Medieval Warm Period or the earlier Roman Warm Period, as is also demonstrated by the hundreds of other such studies reviewed on the co2science.org website. And since none of these "warm-ups," as well as still earlier ones, were driven by increases in the air's CO2 concentration (which hovered around 285 ppm until the Industrial Revolution started it on its upward course towards today's 400 ppm), there is no compelling reason to believe that the 20th century warming of the globe was driven by concurrent anthropogenic CO2 emissions. Keigwin (1996) introduced his classic paleoclimatic study of the northern Sargasso Sea by stating that "it is important to document natural climate variability in order to understand the effects of anthropogenic forcing." And, therefore, working with two subcores of a sediment box core retrieved from 33°41.6'N, 57°36.7'W of the undulating plateau of the northeast Bermuda Rise, he measured the oxygen isotope ratios (?18O) of the white variety of the planktonic foraminifera Globigerinoides ruber, which lives year-round in the upper 25 meters of the northern Sargasso Sea and has a relatively constant annual mass flux and shell flux to the sediments. Calibrating these data against temperature and salinity data obtained at Ocean Station "S" (32°N, 62°30'W) over the prior 42 years, he first determined that "temperature accounts for about two-thirds of the isotopic signal, whereas salinity accounts for one-third." And based on these results, he calculated sea surface temperatures (SSTs) of the prior three millennia, after which he "stacked the temperature proxy data from the two subcores by averaging results in 50-year bins," obtaining the results below. These data clearly indicated there was a period of time in the early part of the past millennium when the climate in the area of the southwestern Baltic Sea was significantly warmer than it is today. The data of Esper et al. (2002) show, in their words, that the warmest portion of the Medieval Warm Period "covers the interval 950-1045, with the peak occurring around 990." Newton et al. stated that their data from the Makassar Strait of Indonesia clearly indicated that "climate changes during the Medieval Warm Period and Little Ice Age were not confined to the high latitudes" nor to countries bordering the North Atlantic Ocean. We now have substantial evidence that throughout portions of both the Roman and Medieval Warm Periods, SSTs in the Indo-Pacific Warm Pool were essentially equivalent to those of "the late twentieth century," indicating - once again - that there is nothing unusual, unnatural or unprecedented about current air temperatures in this critically important region of the globe. The warmth of the more distant past clearly exceeded that of the recent past, with the peak temperature of the MWP exceeding that of the Current Warm Period by about 0.6°C, as best as can be determined from the graphical representation of Ran et al. 's data. The alarmists invariably talk about our current warming as beginning in the mid 1800s, around the beginning of the industrial revolution and when co2 began rising, but that is a cherry-picked date. Our current warming (such as it is) can only be defined as beginning earlier, at the bottom (the low temp) of the Little Ice Age which was in the mid 1600s. That implies our current warming began two centuries BEFORE both the industrial revolution and the increase in co2 level. True, many alarmists claim that alleged man-made global warming could only be related to the CO2 increase since 1950, but rate of warming before and after is essentially identical. The self-deputized Defenders of Truth on Wikipedia will delete any citation of this study as being from a non-reliable source, and repeated attempts to edit Wikipedia to include this opinion are likely to lead to the poster being banned as a Wikipedia editor on issues related to climate change or the Medieval Warm Period. Suggest you try editing with direct reference to the peer-reviewed studies cited in this review. If they still ban that please let me know about it to publicize.